Many of us break the law. I drive too fast. Years ago I smoked some things, and I inhaled. And ...er... so on. But when someone does something that they are supposed to be defending against, it doubly stings: crooked cops, killer doctors, dangerous pilots, ambulances that crash... (stupid educators - oops a favourite theme but off topic). What are we to make of a company whose livelihood is their intellectual property, who then set out to systematically rip off the property of others, and blatantly too? But that is what Acend Corporate Learning of Toronto appears to have done. They should know better. 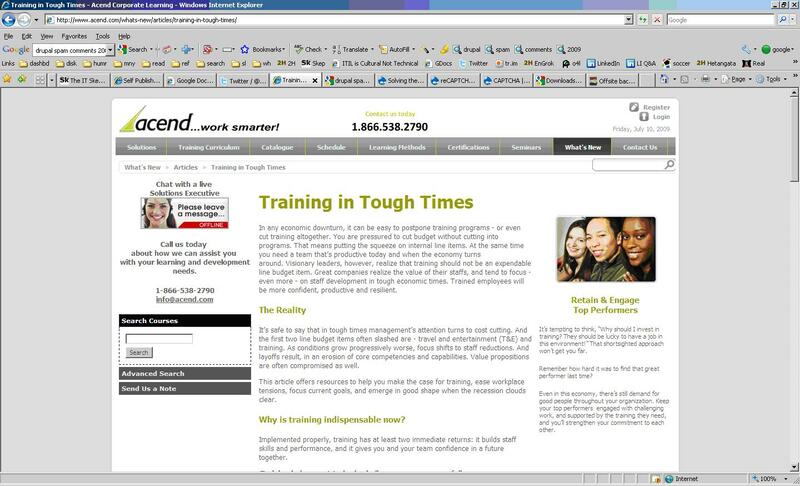 Acend sell training in Toronto and Mississauga. They have a section to their website on Articles. These articles are (or were) presented bald: no attribution, no author, no links. The impression to be had was certainly that they were the work of Acend and displayed the knowledge and insight of their own people. They came to my attention when I saw a twitter comment linking to one of them. I was a little startled to recognise my own work. The introductory paragraph that identified me as the author had been deleted but the remainder of the article was there complete, unedited, word perfect. An email to the site asking what right or permission they had to re-use the material went unanswered but a link to the original website quietly appeared (not even to the article: just to the homepage of ITSMWatch). I sent another email a day later pointing out they had neither right nor permission to reproduce it and demanding they take it down. It resulted in a reply from Kira Matthews saying it would be taken down - no apology. Another day later it is still there [update 13 July: it has gone blank - title still there, no text. Interestingly there was a great discussion on LinkedIn with people saying what a good article the Acend one was, but it then hastily got deleted when someone else complained about the ripoff.]. The last time I caught someone using my material, the owner apologised, claimed a contracted content author had ripped me off not them, and they took it down right away. You can't contract out of accountability for at least checking the content you buy is legitimate, but anyway I left it there that time and I might have this time. Except it appears most of the articles by Acend are plagiarised [update: were plagiarised. Many of the copied articles have token links to the original article and author - not known if this is authorised use - and others have disappeared. But not all are gone]. One after another they come up as copied from websites that have clear copyright statements. Since I made a fuss, one or two now have a link to the original material. Acend's grasp of copyright law is so tenuous or their ethical failure so brazen that they think adding a small link makes it alright. It is not even a link with text acknowledging the original copyright. Even if it were, I know in my case they sought no permission for re-use and I have determined that in at least one other case they didn't either. and at 10th July with the little link added ITSMWatch [update 13 July: it has gone blank - title still there, no text]. 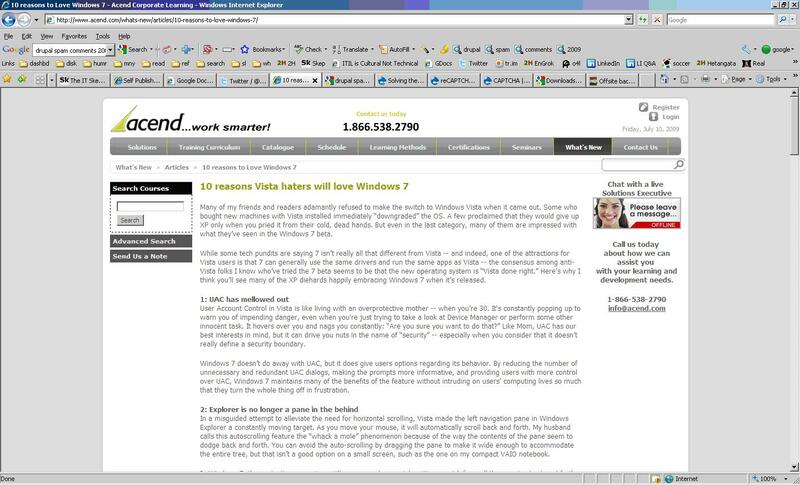 Acend page A screenshot as at 10th July 2009 TechRepublic [update 13 July: now has author's name and a link]. Acend page A screenshot as at 10th July 2009 [updated 14th July It's not clear who is ripping off who here. One Stanley Cherkasky published this article on April18th. then we have CharityVillage Campus Beats me who came first] [update 14th July: strangely SOME of the text has gone but not all. A remnant of the article also remained on their homepage as of 14th July]. 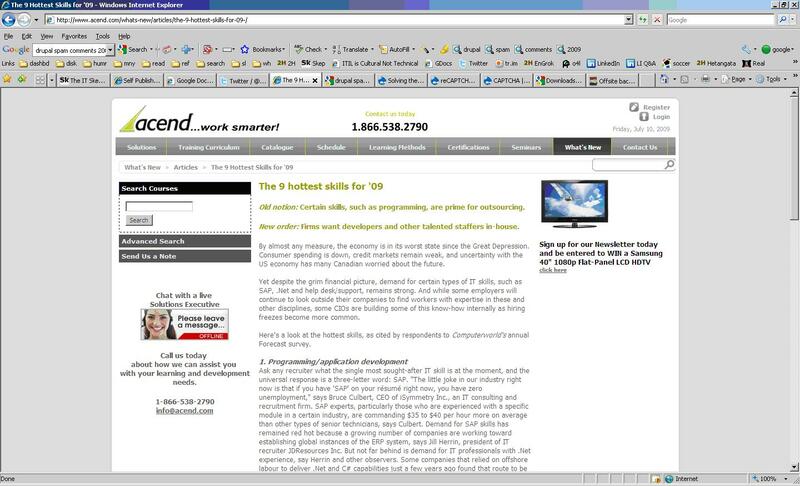 Acend page A screenshot as at 10th July 2009 TechRepublic [update 13 July: it has gone blank - title still there, no text]. 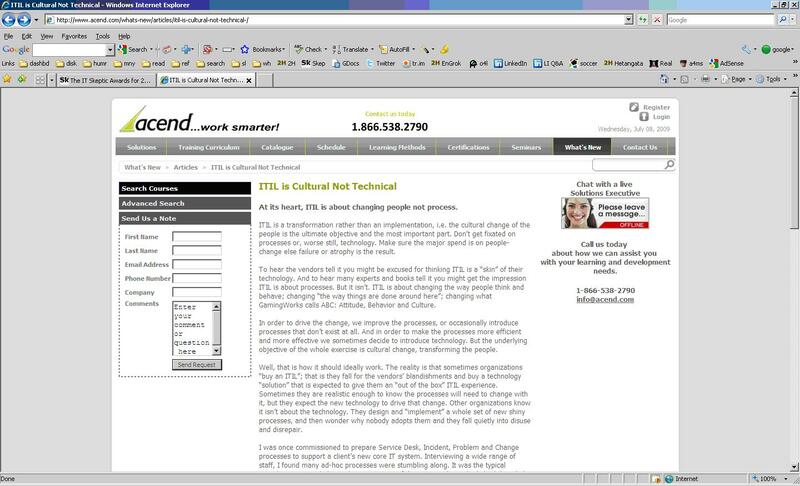 Acend page A screenshot as at 10th July 2009 ComputerWorld [update 13 July: still no attribution]. 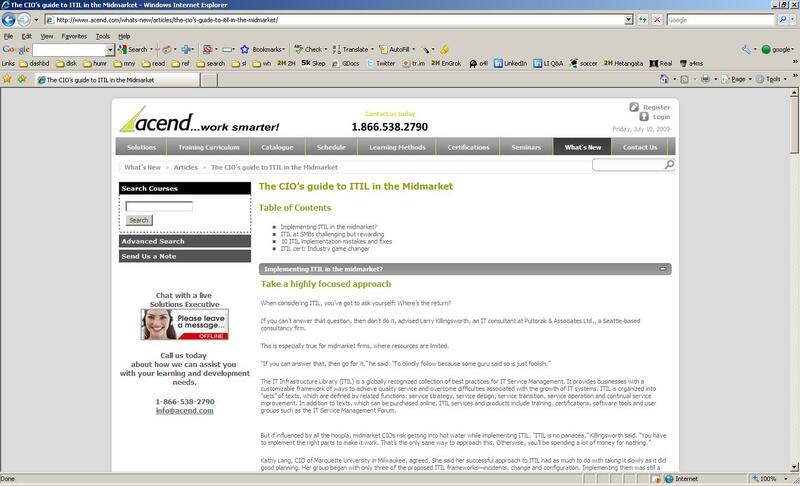 Acend page A screenshot as at 11th July 2009 TechTarget [update 13 July: it has gone blank - title still there, no text]. ...and so on and so on. These are only examples. It gets better. 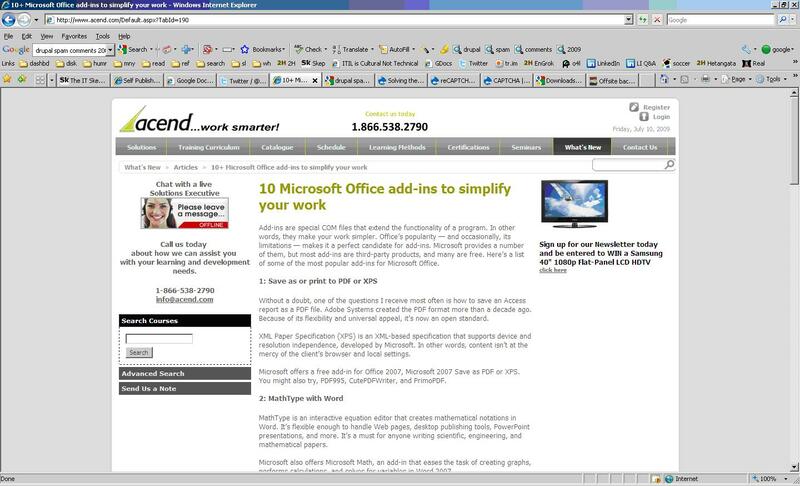 Acend are a Microsoft Gold Certified Partner. Andrew Hunt on the Acend blog re-uses Microsoft's own material without attribution, presenting it as his own (he may or may not have permission from Microsoft to do so). At a minimum Acend are so unprofessional they don't understand their rights and obligations regarding intellectual property. At worst they seem ethically bereft - not an organisation I would want to do business with. If anyone has already been on an Acend training course, please send me a copy of their training materials - they won't mind. These guys just can't help themselves. Even though they cleaned up their blog, one of the remaining articles is still ripped off!!! Look at Andrew Hunt's post of 13th July, unattributed to anyone else. "During my conversations with people over the past few weeks, when I've asked ..."
Compare to this comment by Ed Molson on 2nd July. "During my conversations with people over the past few weeks, when I've asked ..."
Submitted by skeptic on Thu, 2009-08-06 23:38. I'm fascinated by this like the cleanup after a car smash, or a guy picking his nose in the row in front: you don't want to watch but you just can't stop yourself. Stephen Harper’s January budget may have been born out of political necessity, but from that tumult came at least one business initiative of great value: a temporary measure that allows business taxpayers to fully write off computer investments. The change centres on the Capital Cost Allowance (CCA), the percentage of a capital asset’s cost a business may deduct each year for tax purposes. Budget 2009 increases the CCA rate to 100 per cent for computer hardware and systems software acquired after January 27, 2009 and before February 1, 2011. Previously, businesses could only write off 55 per cent of a technology investment, at a rate of 50 per cent per year. In subsequent years, the write off diminished as the remaining balance decreased. So the tax benefit, in the first year, was effectively 27.5 per cent of the total. If a company spent $10,000, it claimed $2,750 in the first year. The claim in the second year was based on the remaining balance of $7,250, and that amount diminished annually. While many have taken advantage of the Home Renovation Tax credit that Stephen Harper announced in January, not as many are aware that businesses will now be allowed a 100% Capital Cost Allowance for computers in the first year, and that this is a temporary two-year measure. These budget changes may have come from political necessity, but from it comes at least one business initiative of great value. This temporary measure allows business taxpayers to fully write off computer investments. The change centres on the Capital Cost Allowance (CCA), the percentage of a capital asset's cost a business may deduct each year for tax purposes. Budget 2009 increases the CCA rate to 100 per cent for computer hardware and systems software acquired after January 27, 2009 and before February 1, 2011. Prior to this announcement, businesses could only write off 55 per cent of a technology investment, at a rate of 50 per cent per year. In subsequent years, the write-off diminished as the remaining balance decreased. So the tax benefit, in the first year, was effectively 27.5 per cent of the total. If a company spent $10,000, it claimed $2,750 in the first year. The claim in the second year was based on the remaining balance of $7,250, and that amount diminished annually. If your company was thinking about buying new computers but had decided to hold off until after the recession, that is no longer a good decision. Business people should consider buying software and equipment now. Oh and the post before that is ripped off from the British government. yeah, nose-picker is about the right analogy. Submitted by skeptic on Tue, 2009-07-28 09:47. When you compare to what Andrew writes when he is being original, My Life in Computers - The Andrew Hunt Story (no, really), perhaps you can understand why he borrows everyone else's stuff. Submitted by skeptic on Wed, 2009-08-05 20:36. I had to remove a comment here because it was potentially libellous. I reiterate that these are not people I would do business with. Submitted by Sarah (not verified) on Fri, 2009-07-17 17:03. Submitted by skeptic on Fri, 2009-07-17 20:51. 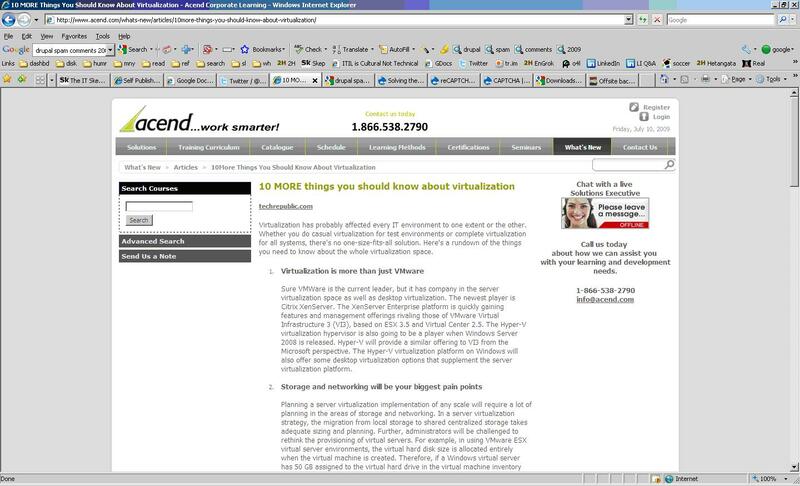 Submitted by Visitor (not verified) on Thu, 2009-10-01 12:37. I feel your pain and I am so terribly sorry for what happened to you. Submitted by skeptic on Fri, 2009-07-17 06:20. 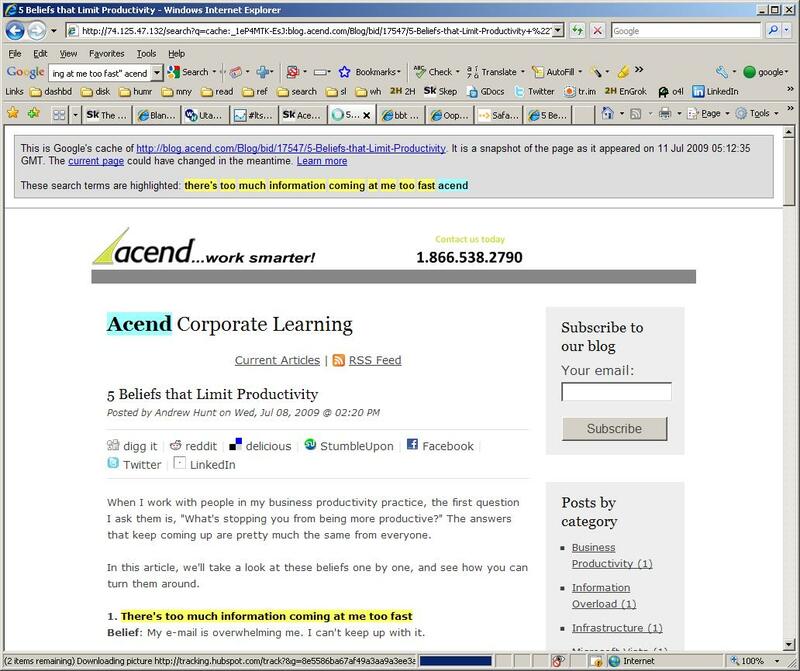 Acend CONTINUE to rip off material, unattributed! Submitted by David Moskowitz (not verified) on Tue, 2009-07-14 17:21. I'll repeat here what I said on Twitter. Legal action strongly suggested! I know about the difficulties. I also know the practice is despicable! Your blog post, while it draws limited attention to the subject, does nothing to curb the practice. At the very least, have a conversation with a lawyer. It is not an impossibility. Consider the following Seabeas motto: "The difficult we do immediately. The impossible just takes a little longer." Submitted by skeptic on Tue, 2009-07-14 21:40. I know of three parties who have referred the matter to their lawyers, but I wonder if it will not get past "cease and desist " letters. i actually prefer this way. 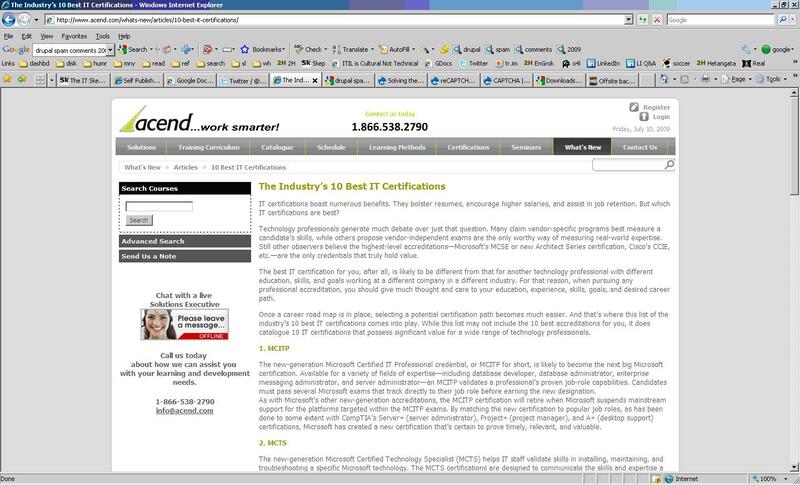 Do a google on "Acend"
Submitted by Mark W. Schumann (not verified) on Sat, 2009-07-11 01:52. ...is this idea that a link or a shout-out excuses the copyright infringement. Yeah, and I can crank out copies of Acend training materials too, as long as I tell everyone where they came from. Not. I know you said this too, but the "we gave you credit" defense soooo gets under my skin. Arrrrgh. Submitted by skeptic on Sat, 2009-07-11 02:00. Submitted by Jan Vromant (not verified) on Sun, 2009-07-12 21:20. Several other articles on this web site are plagiarized. 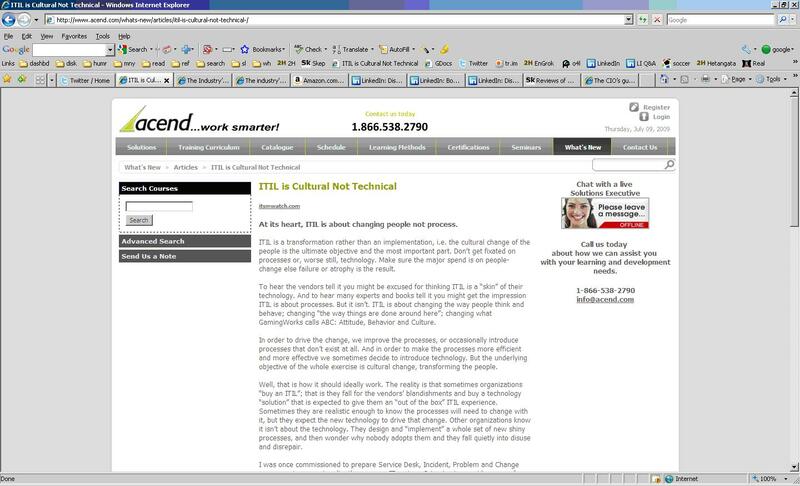 I sent a note to the authors of the "CIO’s guide to ITIL in the Midmarket" article and the "How to Market Training to Your Workforce" article. Both articles omit the names of the author. This is plain and simple theft.